During its 85-year history as a Boy Scout camp, Camp Glen Gray was a refuge of wilderness in the fast-developing Ramapo Mountains of the New Jersey Highlands. When the scouts decided to sell the camp, TPL stepped in to protect the 750-acre parcel—one of the largest still available in the Highlands. 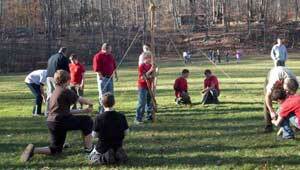 In 2002 TPL worked with Bergen County, which targeted the camp for protection as early as 1986, and used funds from the county, the New Jersey Green Acres Program, and generous donors to purchase the land. Bergen County manages the camp—used for hiking, boating, camping, and environmental education—in conjunction with 3,000 adjacent acres in the Ramapo Mountains. This project preserves an important link in a greenway between Bergen and Passaic counties, the Ramapo Mountains, and southern New York State and helped to safeguard the area from the fast approach of urban sprawl.